I purchased this dresser mirror salvage piece for my mantel earlier this year at Jackson's Icebox Antiques and Collectibles. I went the other way, deciding to use the dresser mirror salvage, and I chose to go with all white tree decorations. I painted Dollar Tree bells and thrift shop star wooden ornaments (on the left) with Annie Sloan Chalk Paint in Old White, and then brushed on a coat of matte Varathane water based poly. I purchased four embroidery hoop ornaments from Kmart, and also purchased several white metal star ornaments and Christmas word ornaments for $1.50 each at a local drug store. AND I used my very favorite white crocheted snowflakes that I have had forever. A four foot tree from Sullivan's floral and gifts, purchased at a local floral shop, holds all of my white ornaments. 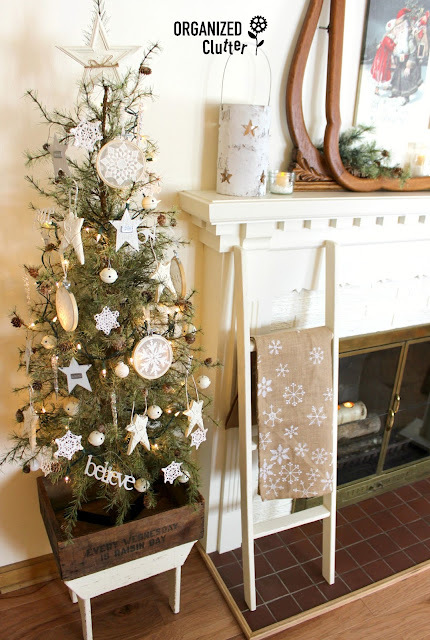 The tree is on top of a white wooden stool and in a vintage raisin crate. A burlap runner with white snowflakes hangs on a 1960's bunk bed ladder, purchased at a garage sale, and painted in ASCP in Old White. Large Christmas trees are a thing of the past here. No kids at home, no kids or grandkids even in town. This small tree will work for a two day celebration. No furniture removal or re-arranging necessary! 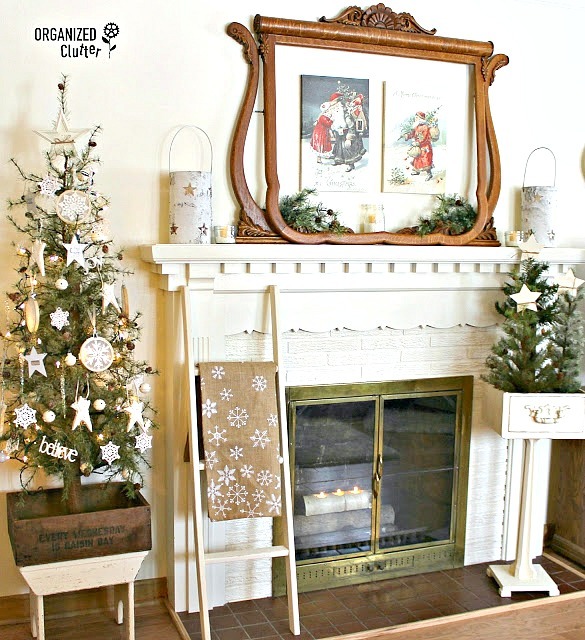 My mantel has two vintage look Old St Nick canvases hanging in the dresser mirror frame, along with faux greenery, jars with faux snow and flame-less candles and birch bark candle holders as well on the mantel. Do you have a real fireplace? I love my fireplace but I hate the mess of wood. I used to buy short burning logs from Menards to burn in the fireplace on holidays. Thrift shop to the rescue. This birch log was an easy addition to my fireplace. I took the votive candles and glass holders out of the pre-drilled log and added tealights. 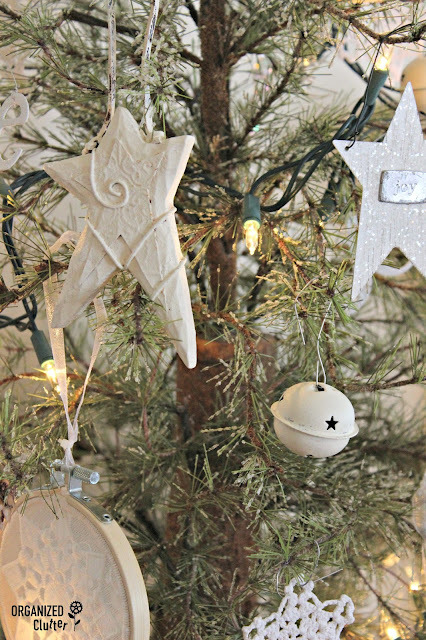 These craft shop stars were also painted white and tied on three miniature faux trees with jute. Remember this repurposed drawer plant stand? Birch log in the fireplace! 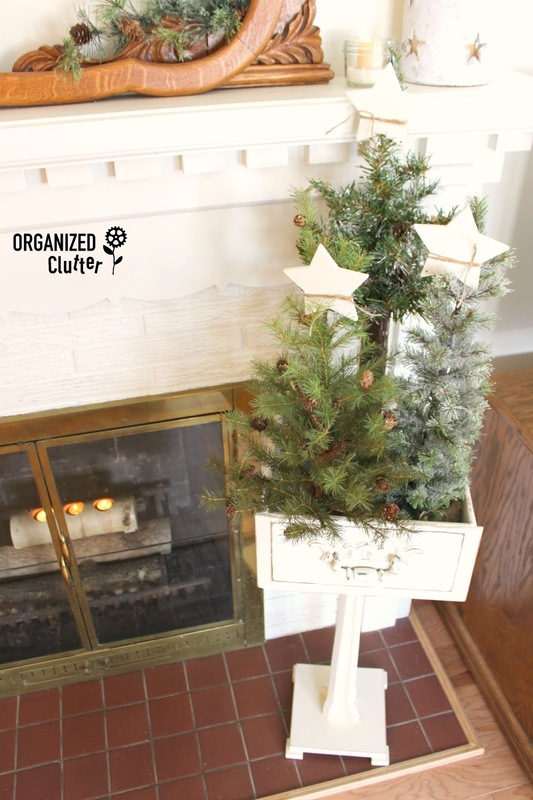 A very different mantel for Organized Clutter this year! 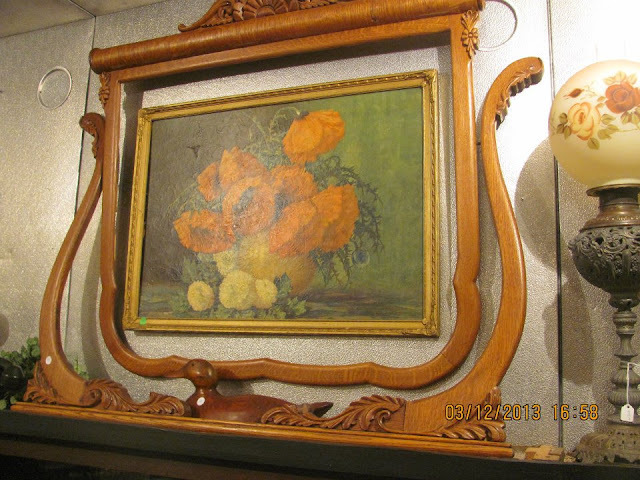 Carlene, how clever to use the dresser mirror frame on your mantel. It works easily for any season. I like the simplicity of the greens and the Old St. Nick canvases. Well done! You have a beautiful mantle to start with, and a real knack for putting things together. We have a home built in 1886 that had no mantle. The homeowner built it with a big coal burner in the basement. My loss! I would love to have a fireplace with a mantle. You are so talented! My husband and I buy vintage things at auction for resale. Now I am thinking I should be keeping some of this stuff, and decorating my house with it instead! Oh Carlene, I was smitten by your lovely 2016 mantel. Just gorgeous. Thank you for sharing all the lovely mantel posts over the past years. Your 2013 arrangement, I have everything in the photo but the MANTEL and the little green stove. How sweet. Somewhere over time, I've lost connection thru my blog, but this A.M. you appeared on my FB page and I now subscribe to yours by email. Guess I don't connect too much with my blog reading list anymore. Have a fun filled day. Winter storm watch here and I plan to stay in and wrap gifts. Merry, Merry. All of your mantel displays are beautiful. 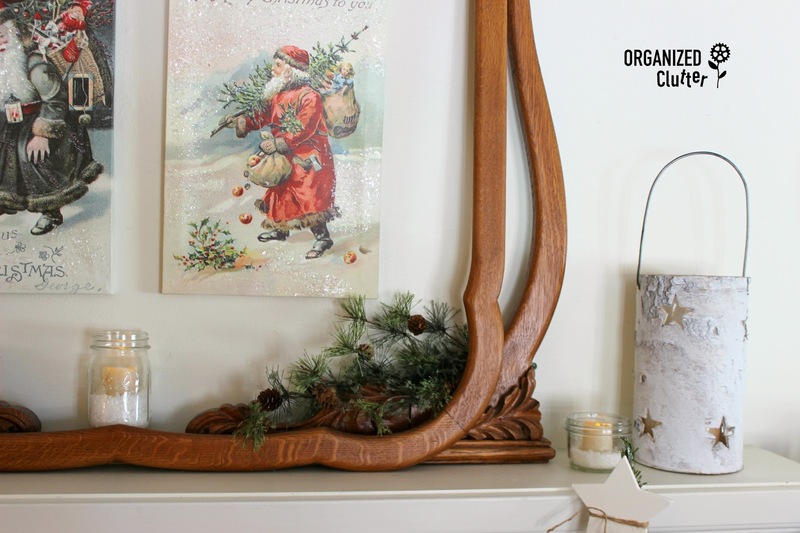 You have such talent when it comes to decorating with your repurposed pieces. I always enjoy your posts. Happy holidays!! So beautiful! Again, I repeat myself.....you have the best ideas! This is perfection. We have a small tree too, and it's so easy to take down later. Your mantels are all gorgeous, but you outdid yourself this year! My favorite!! Wow! I love every mantel you've done. I've kept mine the same for 10 years with a vintage Santa and vintage toys. I can't bare to change it because I love it so. You've inspired me to change it up...maybe next year. Pinning all your mantels for inspiration. Carlene ... all your mantels are so interesting. Love them all. 2016 is really different for you and I love the simple uncluttered look. Love that mirror salvage too. Sometimes I start out to do a very simple mantel then end up with too much and it does look cluttered. Thanks for sharing ... Happy Christmas. It's good. Very, very good. I don't have a lot of short cuts on my desktop to websites, but yours is there. Your frugality looks like you spent hundreds and that's not easy to pull off. Oh my goodness... so gorgeous, Carlene! I adore the softness! But I am still madly in LOVE with the others too. You are a stylist maniac! Love your simple mantle. It is beautiful. 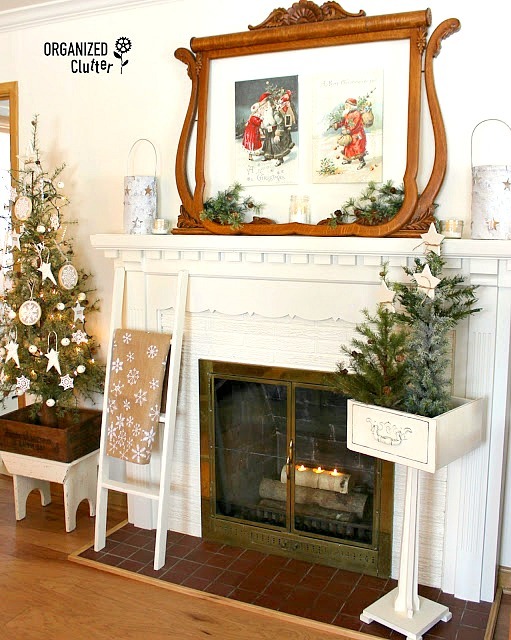 Carlene, love the use of the old mirror frame on the mantel! It's the perfect touch! Like your 2015 mantle also. They're all very nice. I'm like you...no kids or grandkids about, so we don't even have a big tree. I like that just fine. Guess I've gotten lazy, or maybe lazier.